For those of you visiting the site today and wondering where all of the great Canadian news is that I usually share with you, well, we’re at SIGGRAPH 2011 with limited internet access, so posting any news is going to be a challenge. That said, there are lots of awesome Canadian companies (or international companies with a Canadian location) at SIGGRAPH this year, so I hope you stop by to visit. I’ve listed those with booths below. We are in Booth 1018 – please stop by for a visit and an interview. In the meantime, we have soft-launched our new project. Right now you can only look at our announcement, because there just aren’t enough hours in the day for the two of us to work on the new project, work on Village Gamer, get ready for SIGGRAPH and put in appearances at our paying day jobs. So, without further ado, please visit Canadian Creative and sign up for email notifications (we won’t be selling, renting or giving away your addresses) so that you know when the front door is unlocked and the coffee is on. Have you made Vancouver home for the next six days? If so, that must mean you’re planning to be at SIGGRAPH 2011, which opens tomorrow at the Vancouver Convention Centre and runs until Thursday evening. The Conference and Computer Animation Festival goes from August 7 right through until the 11th and the Exhibition floor with (200+ displays) is open from August 9th through 11th. It is still possible to pick up single day passes, and at just $45.00, they are too good of a deal to miss out on. If you prefer, there are passes still available for the entire week. We got a sneak peek at the expo floor last evening, and it looks awesome. Check out your options on the SIGGRAPH 2011 Registration Info page. This is the first time the flagship conference for the ACM SIGGRAPH organization has been held in Canada, and is an incredible opportunity for the Canadian digital media and film industry sectors. There are, at my count, 37 Canadian companies – or international companies with a Canadian location – with exhibit booths on the conference floor, including ourselves in Booth 1018. This does not include the number of Canadian companies who may have a booth in the Job Fair area of the conference, nor those like Corel who will be working out of LightBox’s booth. Nor does it include the Canadian studios who will be represented in our booth with their trailers and games or those being highlighted through the DFAIT and provincial economic development booths. There is without a doubt going to be lots to see, lots to learn, and many people to meet at SIGGRAPH 2011. Displays: Watch attendees interacting with cutting-edge 3D displays that will change their home theaters and video game experiences. Robotics, Wearables, and Haptics: See people engaging with robots and stimulation devices such as a wearable pregnancy jacket that allows the user to feel a fetus’s temperature, movements, and heartbeat. Mobile Devices: Interact with the next wave of advancements in mobile technological devices such as a “watch” that turns your hand into a mini-keyboard. You can get a look at the expo floor map (PDF) on the SIGGRAPH web site, it is current as of August 1st, and for those who are not aware, the expo hall is on the lower level of the new convention centre. 3D3 Solutions, a Burnaby, BC developer of 3D scanning technologies, will be exhibiting at SIGGRAPH 2011 in Vancouver, where they will offer attendees at the conference free 3D face scanning demonstrations at their booth #879. The face scanning process involves using a 3D scanner to capture an accurate 3D mesh and color texture directly from a human face. The output is especially useful in the video games, visual effects and medical imaging industry. 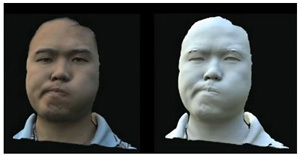 3D3 Solutions will feature the HDI 3D Scanner to demonstrate live face scanning at Siggraph. Their scanner uses white-light technology to capture high-resolution, color 3D scan in less than 1.4 seconds. Attendees will be provided with the 3D data of their face scans for personal use. Please visit booth #879 at SIGGRAPH 2011 to learn more about 3D3 Solutions’ 3D scanning technology. TransGaming Inc. is proud to announce the celebrity judging panel for the $50,000 GameTree TV Developer Competition. The panel will consist of actor, director, producer and writer LeVar Burton, president of development at Jerry Bruckheimer Games Inc., Jay Cohen, and Lorne Lanning, cofounder of Oddmobb, Inc. TransGaming will announce the winner of the competition at Casual Connect, the world’s premier casual games conference, taking place July 19-21, 2011 in Seattle, WA. The GameTree TV Developer competition gives independent game developers the chance to win more than $50,000 in cash prizes by bringing their games to GameTree TV, the premier on-demand gaming platform for Smart TV. Finalists will have their game featured on GameTree TV, putting them in front of millions of consumers around the world as the adoption of Smart TV continues to grow. GameTree TV is commercially available on next-generation set-top boxes and connected consumer electronic (CE) devices. 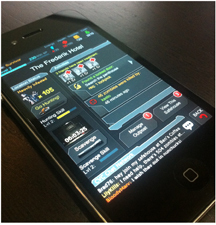 Developers can find more information and submit their games at online until 11:59pm ET on June 15th 2011. A couple of weeks ago I had the unique chance to sit down with Inspirado Games CEO Rick Davidson and chat about his company’s latest game, Gardenmind. Gardenmind is a Facebook social game in which players grow plants in their virtual garden, with each plant being associated to a different game mode. Some plants are word games while others are perception games, with more games and plants offered as the player continues to play through Gardenmind. People who enjoy challenging their brains and playing puzzles will enjoy this game. The other awesome thing about Gardenmind is that it is a meaningful game; besides learning and challenging their brains players can also contribute to a cause they would like to support. One example of this is with trees like the New Zealand silver fern. If players buy the tree a percentage of the cost goes to support quake relief in Christchurch and players are rewarded with a kiwi to walk around their garden. Inspirado Games works with the World Wildlife Fund to support the organization’s causes around the world and Gardenmind was recently nominated for a Canadian Video Game Award for best social game. When we sat down we talked about how long Inspirado has been around, why they are doing what they are and why they thought they would make this game. We also chat about gaming and the growth of the industry in Vancouver. It was a great chatting with Rick and I hope you enjoy the videos. TransGaming Inc. (TSX VENTURE:TNG) announced yesterday that it granted options to purchase 1,800,000 common shares under the Company’s stock option plan, of which 530,000 were granted to directors and officers. The granted options have an exercise price of $0.82 (being the May 16, 2011 closing price of the shares on the TSX Venture Exchange), vest 1/4 each year on June 1 from 2011-2014, and expire on May 17, 2016. The stock option grants remain subject to acceptance for filing by the TSX Venture Exchange under Policy 4.4 (“Incentive Stock Options”) of the TSX Venture Exchange Corporate Finance Manual. Glacier Media Inc. (TSX:GVC) is pleased to announce that, through one of its affiliates, it has entered into a definitive agreement with Rogers Publishing Limited to acquire a portfolio of media assets from Rogers’ business and professional publishing group. The assets comprise 15 trade publications and digital brands, together with their associated readership database, events and web presence. Properties acquired include established and leading publications such as Food in Canada, Le Bulletin des agriculteurs, Canadian Packaging, HPAC and Meetings & Incentive Travel (including Incentiveworks, Canada’s largest trade show for the meetings, incentive travel and promotions industry). The assets will integrate into Glacier’s Business Information Group, a leading operator of Canadian trade publications and industry-focused web sites, and Glacier’s Farm Business Communications. Utilize acquired technologies to accelerate the online capabilities and reach of the Business Information Group’s directory products, especially Scott’s Directories. The transaction is expected to close on May 27, 2011. Yesterday was the official launch of Opportunity CAN, a 40-day event celebrating Opportunity International’s 40-year history empowering people across the developing world to work their way out of poverty using financial tools. During the event, Canadians will use their unique skills and creativity to fulfill a personal challenge or host a meal that will help end poverty through microfinance. Toronto-based branding agency The BrainStorm Group recently launched a new brand strategy and visual identity for Connecticut-based Open Solutions, Inc.®, an innovator of core banking platforms for financial service providers across the United States, Canada and other international markets. The new brand position, “There’s Power in Community” reinforces the open architecture of the Open Solutions platform including the newly launched DNAcreator and DNAappstore. It also reflects the collaborative nature of Open Solution’s client relationships. The new visual identity includes an updated logo, complete brand architecture and messaging – bringing the new identity to life. It also features an iconic green “O” that brings the positioning to life through its usage across many communication mediums – including a new website. The rebrand was launched at the 2011 Open Solutions client conference in Washington, DC, on Monday, May 2, 2011, in front of more than 1,200 attendees. The BrainStorm Group was selected for the rebranding project after a competitive search process based on their proven branding process, creative approach, experience and team. The search process and oversight of the project was managed by Lovallo Communications Group LLC, Ridgefield, CT.
Game Dev studio Endloop X has relaunched with a new name and a new look – Massive Damage Inc. The company’s official blog states that Endloop X was meant to be a placeholder, a temporary name until they came up with “the right name” – and anyone who has tried to name anything, knows how difficult this can be. The name Massive Damage fits well with the studio’s goals to disrupt the mobile social gaming space, and seemed to be the logical answer to the equation of Massively Multiplayer + Massive Disruption + Massive Impact. Location is key, it’s not about geography, it’s about people’s inherent affinity to their favorite spots. While the game can be played from your office, players will derive more value from moving around. The studio aims to be able to direct players to specific locations for special events. A venue is a natural opportunity to drive organic social team play without the usual headaches involve with explicit teamwork. The studio calls this asynchronous dynamic massively co-operative gameplay. Please Stay Calm integrates existing social graph information into the game narrative. Since the game fiction is layered on top of the real world, people will immediately feel like they are playing in a vibrant active game world even if few people are actually playing in their area. All of you who are waiting to get more details on the next Assassin’s Creed title from Ubisoft Montreal need to take part in the studio’s viral marketing effort. 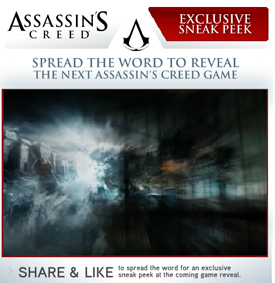 The studio will reveal more information the more people share the AC Reveal app on Facebook. The images so far have been typically cryptic – reflecting the Subject 16-styled video puzzles Assassin’s Creed players have become familiar with. There is an image of what looks to be Jerusalem – is it the city under 16th century Ottoman rule? This could fit neatly at the tail end of Brotherhood, should the developers be continuing the Ezio story, that is. However, there are also flashes of the Phaistos Disc, which points to Crete – and a hint of the current Greek flag does seem to flash on the screen – but it didn’t come into use until the 1800’s. The armoured hand appears to belong to Altair, whose name is flashed across the screen in Arabic – or is it someone new to the franchise? Is that the Apple of Eden glowing in the image’s centre – or just the sun viewed through Eagle Vision? There is the speculation that the next Assassin’s Creed will be titled Revelations, which is of course being fueled by Ubisoft’s social media corps. At press time the unlock graph was only at 11% – if you are at all curious about what the studio will reveal and have a Facebook account, share with your friends and get them to share with their friends so we can all have a closer look – as the Unlock level increases, there are more clues added to the cinematic. Today is the final day to apply for the Canada Media Fund-presented Canadian Interactive Showcase at INplay 2011, which will be held in Toronto on May 17th & 18th. Registration for the conference is still open – register online to save $100.00 off the door price. Microsoft Game Studios has revealed the official site for its Vancouver studio, which might be hiring, by the wa y – I say might because the MGSV site says there are no positions open, but the MGS Careers page says there are. According to the new site, the Vancouver studio is ‘dedicated to making games for “core” gamers. Our mission is to push the limits of proven and unexplored game development and show the world what’s possible on Microsoft’s game consoles.’ This makes me happy – I can look forward to new titles for my 360 – as long as they aren’t for Kinect, because we don’t have yet have that peripheral. SIGGRAPH 2011 has begun posting the Birds of a Feather activities for the conference this August. Check out the offerings, and if you would like to see a group meetup added, you are invited to submit your suggestion to the conference committee. Don’t forget, SIGGRAPH 2011 is August 7th through 11th in Vancouver. Make It Home. Okino Computer Graphics has announced that its 3D DCC/Animation/Skinning and CAD/MCAD/Architectural conversion software PolyTrans-for-3ds-Max (for 3ds Max 2012 & 3ds Max Design 2012), and PolyTrans-for-Maya (for Maya 2012), are now fully qualified and shipping to customers. This is a general notice to those Okino customers who have not upgraded to the 2011/2012 releases yet, and for those not aware of Okino?s software for 3ds Max & Maya. Virgin Mobile Canada and Walt Disney Studios Motion Pictures Canada are digging up some real treasure with their next A-list benefit for Virgin Mobile Members across Canada. As part of an ongoing program delivering the latest movies first, Virgin Mobile has already offered its Members access to advance screenings for hits like I Am Number Four. On May 18, winning Members will have the opportunity to catch the most anticipated film of 2011, Pirates of the Caribbean: On Stranger Tides, before its general release on May 20, 2011. A total of 140 winners and their guests from Toronto, Montréal, Ottawa, Edmonton, Calgary, Winnipeg and Vancouver will get the chance to see the action-packed flick – starring Johnny Depp and Penélope Cruz – before anyone else. Plus, one super-lucky Member and their plus one will get some serious VIP treatment: travel and two nights stay in L.A., walking the red carpet at the Hollywood movie premiere of Pirates of the Caribbean: On Stranger Tides and access to a super exclusive after-party. Follow Virgin Mobile’s Twitter at @virginmobilecan to see all the latest tweets from the VIP Member while they walk the plank – or red carpet – at the premiere. To enter for the chance to be at one of the pre-screenings or walk the red carpet at Disneyland as Virgin Mobile’s Red Carpet Reviewer, visit The Lounge on Virgin Canada’s site or the Facebook Contest tab on Facebook. More big time opportunities are always around the corner with the hottest new movies getting delivered to Virgin Mobile Members. The next big blockbusters coming soon to a theatre near you: the 3-D horror remake Fright Night and the high adrenaline Hugh Jackman action film Real Steel. Dr. Ann Cavoukian, Ontario’s Information and Privacy Commissioner, will unveil details about a new extension of Privacy by Design, called Privacy by ReDesign, in a keynote speech at a premier Canadian privacy event, in Toronto on May 5. At the same time, the Commissioner will address recent concerns over location tracking in popular smart phones and mobile devices. This hotbed topic will also be featured at a session on the privacy implications of mobile computing led by the Commissioner’s Office. Renowned privacy experts will attend to discuss the protection of privacy in today’s world of ongoing technological advances. It is all taking place at The International Association of Privacy Professionals‘ (IAPP) Canada Privacy Symposium at Ryerson University. Since the 1990’s, Commissioner Cavoukian has advocated for organizations to proactively embed privacy into technology right from the outset, a concept called Privacy by Design. International privacy regulators unanimously passed a landmark Resolution in 2010 recognizing the made-in-Ontario solution as a Global Privacy Standard. The U.S. Federal Trade Commission now recommends Privacy by Design for protecting online privacy.